Forget everything you think you know about strength, strategy and success. This brilliant adaptation of the ancient masterpiece The Art of War shows women how to use Sun Tzu's philosophy to win in every aspect of life. Would you like to transform your weaknesses into strengths? Succeed at work without compromising your ethics? Integrate your style and personal philosophy into every action you take? If so, this book is for you. In The Art of War for Women, bestselling author Chin-Ning Chu brings the eternal wisdom of philosopher-general Sun Tzu to women looking to gain a better understanding of who they are--and, more importantly, who they want to be. Although Sun Tzu's book is about the application of strategies and determining the most efficient way of gaining victory with the least amount of conflict, every one of those strategies begins with having a deep understanding of the people and the world around us. They also require us to understand ourselves--our strengths and weaknesses, our goals and fears. In other words, the aim is not to apply a series of rules coldly and dispassionately, but rather to integrate ourselves and our unique talents into the strategies we will employ. This is not a feel-good book. (But you will feel good after reading it.) It is not a motivational book. (But you will be motivated to achieve what you want, once you are done.) Ultimately, its purpose it to provide women with the strategies we all need to overcome the obstacles that stand in the way of our goals and dreams. Sun Tzu's Art of War is the most influential book on strategy ever published, selling tens of millions of copies worldwide in several editions. 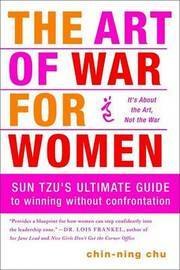 Written by one of today's foremost authorities on Sun Tzu, The Art of War for Women is sure to become a classic in its own right. CHIN-NING CHU, an internationally renowned speaker and the bestselling author of Thick Face, Black Heart, is a descendant of Chu Yuan-Zhang, the pauper who became the first Emperor of the Ming Dynasty by defeating the descendant of Genghis Khan. The president of Asian Marketing Consultants, Inc., chairperson of the Strategic Learning Institute, and president of Neuroscience Industries, Inc., she was a major contributor to the Discovery Television Great Book series on The Art of War.